Most Megadrive fans will give up some familiar names when asked to declare their favourite RPG on Sega’s famous console: Shining Force. Phantasy Star. Soleil. Dungeons & Dragons: Warriors of the Eternal Sun. Yet one name that frequently slips under the radar is Buck Rogers: Countdown to Doomsday, SSI’s adaptation of their own Amiga and PC game. Actually, the game has many fans and according to Graeme Mason there is an obvious reason for this – it’s a very good game! Buck Rogers is set in the 25th Century, an era of greed, pollution and war between the New Earth Organisation (NEO) and the malicious Russo-American Mercantile (RAM) forces. Before the action starts, your first task is to assemble your team of up to six characters who are then thrust immediately into the middle of a pitched battle. From here you are summoned to the hidden NEO base of Salvation and take the fight to the evil RAM on Mars, in the process uncovering a nasty piece of genetic experimentation, exploring Venus and Mercury, fending off a bunch of vicious pirates and engaging in various frantic space battles. Countdown to Doomsday was not an obvious game for a 16-bit console conversion due to its size and complexity, so numerous changes were forced upon SSI. The team leader for the Megadrive game was producer Tony Van who contributed several design elements as well as alterations to the space combat and the inclusion of the percentage-to-hit statistics. Programmer Michael McNally was charged with main the task of squeezing this complex RPG on to the Megadrive. There was a not-inconsiderable struggle to make the game fit into the console, leading to several differences from the original game. Fortunately the SSI team were happy to let Michael make changes due to the technical quirks of the platform, although in reality they had little choice. The restraints of the cartridge format also saw a simplification of the RPG elements and some artwork had to be trimmed due to memory constraints giving fewer options. Michael also streamlined the combat and navigation views, a shock to the team when he first demonstrated it that soon became admiration when they realised it was necessary if they were to squeeze the game into a 16-bit cartridge. Michael was also required to customize a new user interface and implement a semi-random tiling scheme for the additional backdrops now required for the dual isometric displays. Unlike the Amiga and PC versions, the Megadrive conversion is presented in a third person isometric view. Whilst in exploration mode your team is shown as one character, but as soon as a battle commences a magnified view is displayed with all your team members present as well as the enemies you have to fight. Additional screens include a space exploration map where you can dock at space stations, land on planets and of course encounter enemy spaceships to be fought or eluded. In the traditional RPGstyle, each character has a percentage-to-hit figure influenced by their skill, type of weapon and position in relation to the target. Each turn allocates a set number of points to the player, giving combat an extra tactical element – do you use up valuable points moving to a better firing position, or just blaze away? And of course as with most RPGs, there are the usual trappings such as levelling up, character development and weapon upgrades, all with the expected sci-fi twist. Character classes are also critical – a good mix of fighters, pilots and medics is a must if you are to succeed in your mission. Buck Rogers is remarkably easy to pick up, despite a tricky opening section, and you will soon find yourself knee deep in the NEO-RAM conflict. 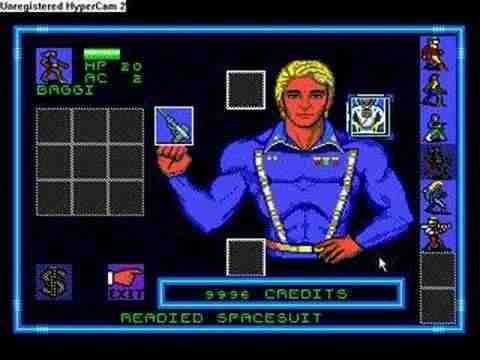 This is where the game really shines through, as the player feels a part of a solar system-wide resistance movement as they attempt to locate and destroy RAM’s terrible Doomsday weapon, and of course meet the famous Buck Rogers. How much the plot draws on traditional Rogers mythology is debatable, but it’s undoubtedly one of the game’s strong points. Particularly atmospheric is the mission on board the strangely deserted spaceship, an experience that will leave goosebumps on your skin as the full evil machinations of RAM become apparent. 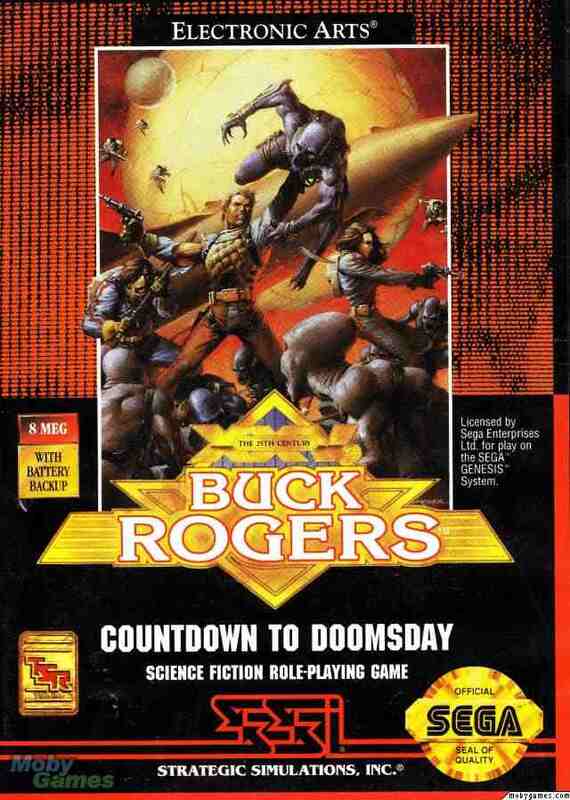 Buck Rogers: Countdown to Doomsday is a testament to what can be achieved with a limited capacity thanks to a bit of ingenuity and a dab of cunning, and is in your humble author’s opinion one of the best games on the Megadrive! This article was originally published in Replay Magazine, 2011.